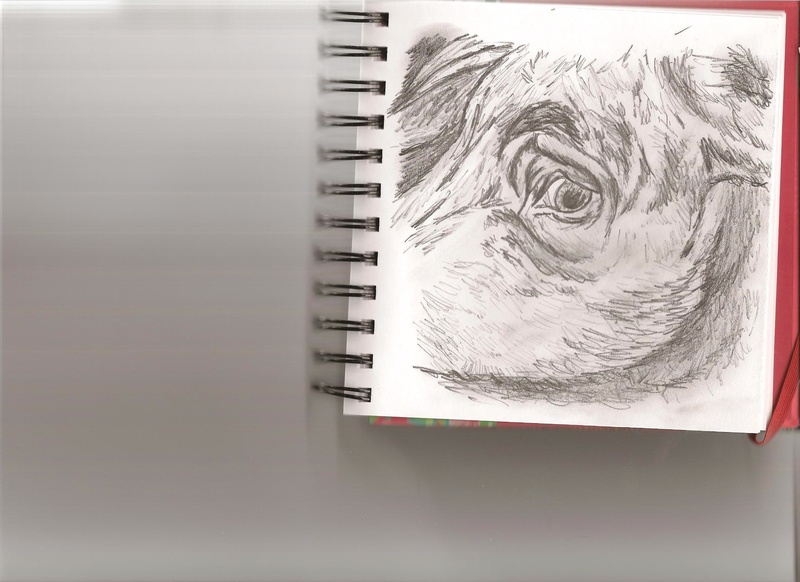 This is a sketch Twyla Francois, an investigator with Canadians for the Ethical Treatment of Food Animals, did of a sow she tried to help at an auction. Twyla says, “The sketch has not been exaggerated in any way – this was her real expression. 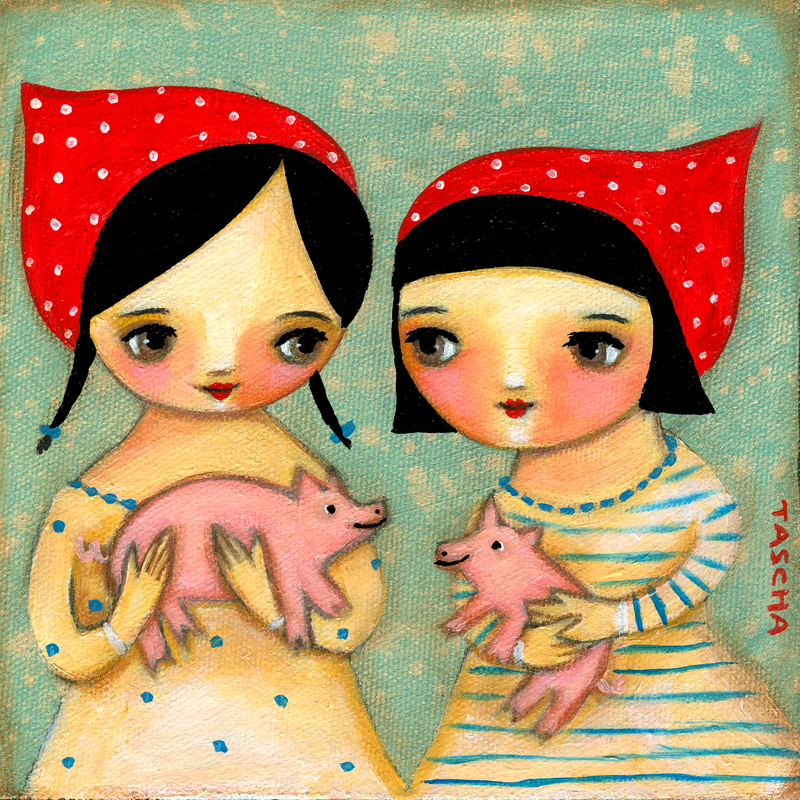 She was pleading to have her pain stopped.” Twyla tells Tara’s story, “Tara: The Story of One Sow”, here (in PDF format). At the end of the narrative, Twyla writes: “As Tara’s story shows, farm animals desperately need us to advocate for them wherever they are. Because of this, CETFA has created a volunteer inspector program. Volunteer inspectors can be anyone with an interest in helping farm animals – at auctions, at collecting stations and during transport – anywhere these animals are publicly accessible. Please see our website for the Volunteer Inspector’s Checklist or contact us at care@cetfa.com”. “Friend not food!” by Bob Timmons, Artist for the Ocean. 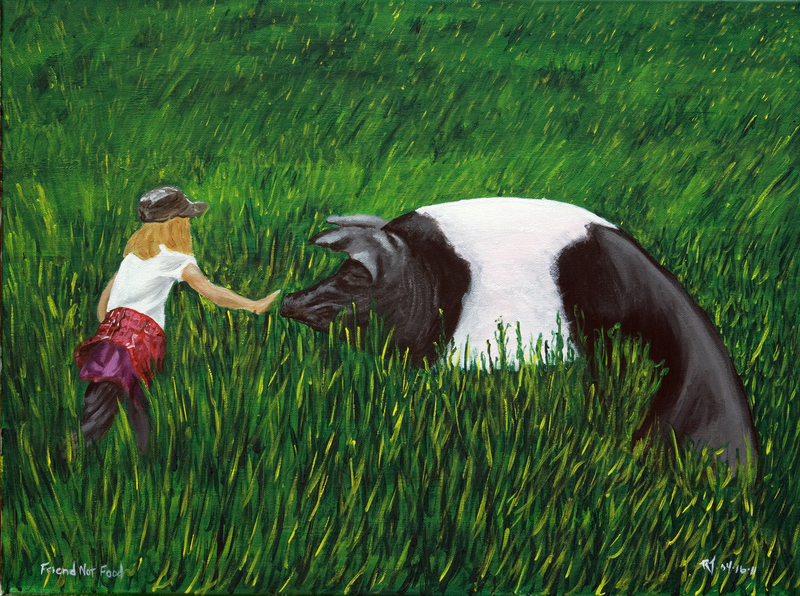 Depicts his daughter and pig playing in the field. 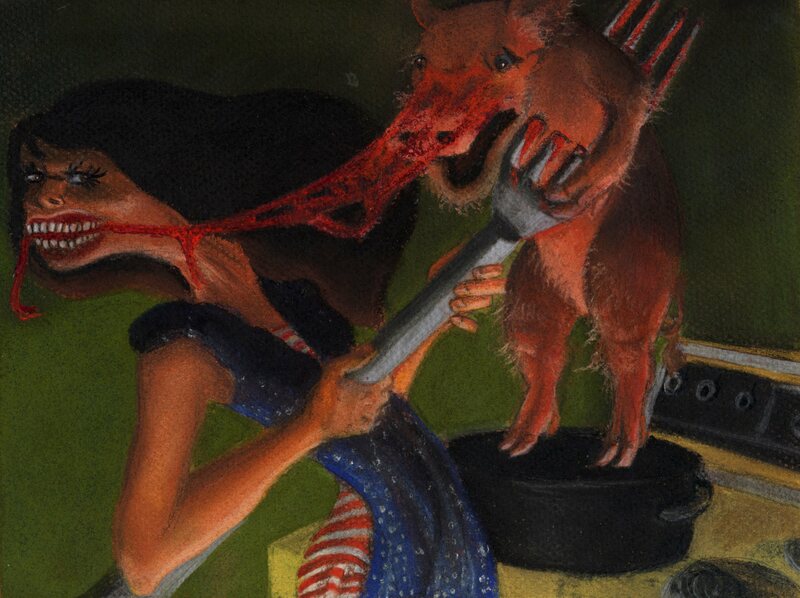 Dirk Giesselmann is a leading vegan, multi-media artist in Germany. See his powerful flyers, posters, photos and videos at his soylent website and English translations of some of his works on our website. 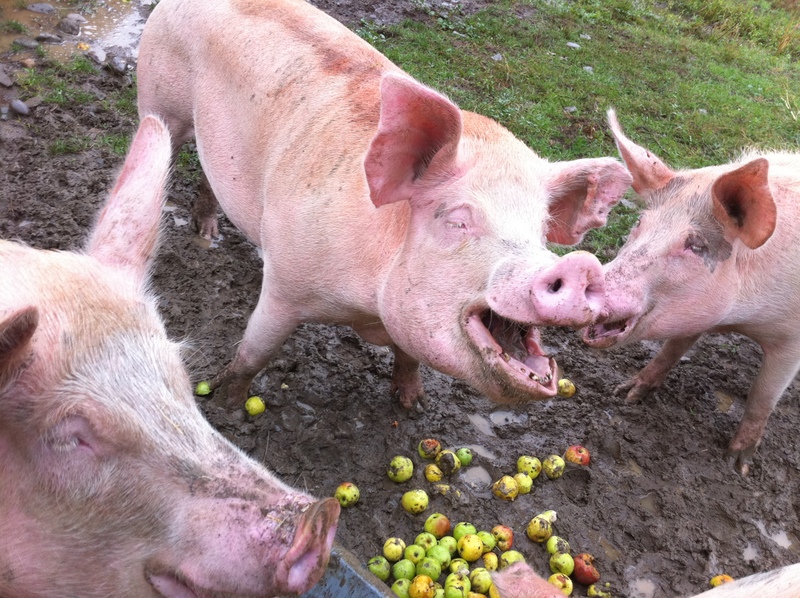 Twyla writes: “In my experience, pigs are the worst treated of all farm animals. It is as though they are singled out for abuse. If they have the misfortune of being a sow they will not know one moment of kindness their whole life through. 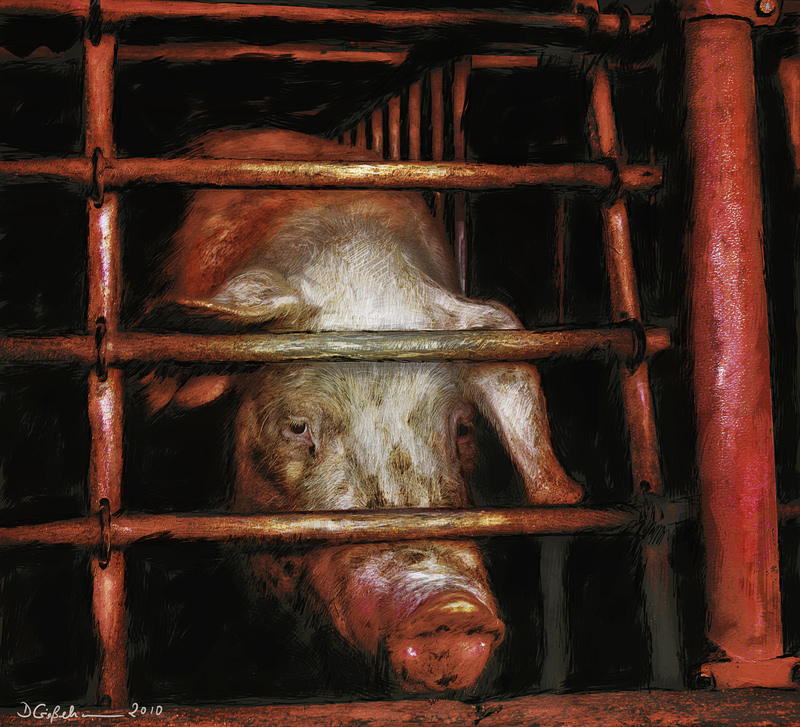 Sows (breeding female pigs), are confined to barren metal crates only slightly larger than themselves for their entire adult lives. They develop crippling arthritis, are prone to fractures and often become lame. The vast majority, have pneumonia from living atop and breathing in their own waste and the waste of up to 5,000 other sows. They are driven mad by the incessant boredom, the constant craving for food and the continually thwarted natural instinct to build a nest for their soon-to-arrive piglets. She will have only 2 weeks with her babies (during which time she remains in a crate although somewhat larger), who will then be ripped away from her (I’ve seen sows punched in the face to remove them). She will be re-inseminated, then put back into a crate for the duration of her pregnancy. By the time these sows are culled they are so worn out, beaten up and decimated they can barely walk. Because they are seen as so worthless they are often discarded on dead piles, killed in inhumane ways or abused with unspeakable acts. 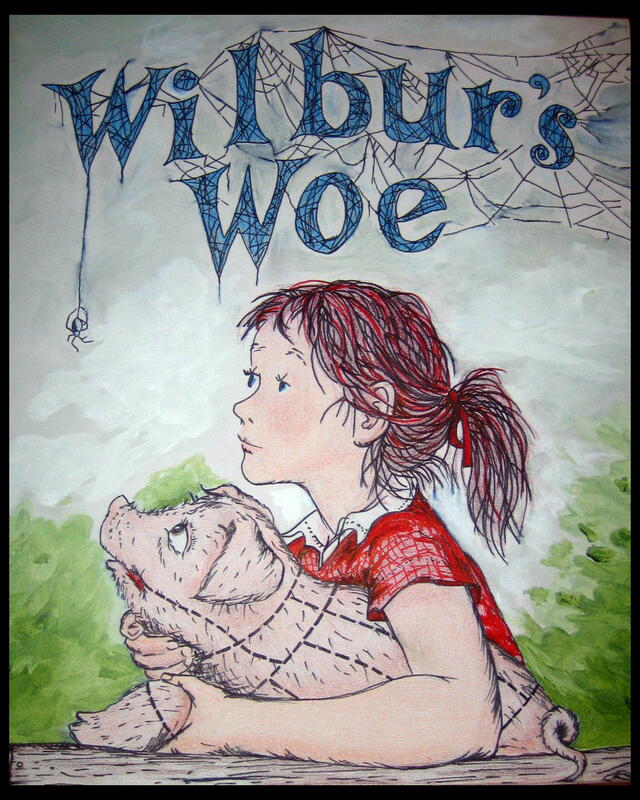 “This is a simple painting to remind us what Wilbur’s fate is – to contrast between how we are allowed to see farm animals as children, vs the adult vision we have of them (as cuts of meat). 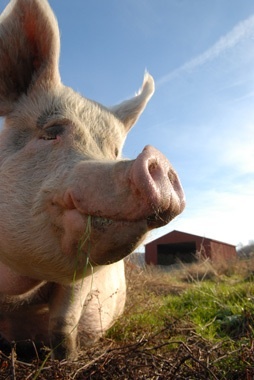 It reminds us that when we eat pork we are eating an animal as worthy, intelligent and loving as Wilbur was. 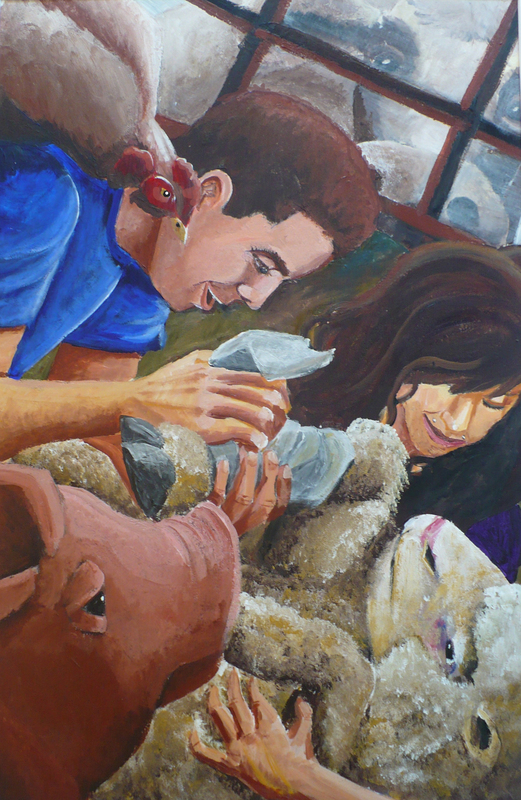 For more of Twyla Francois’ farm animal art and narrative, click here. 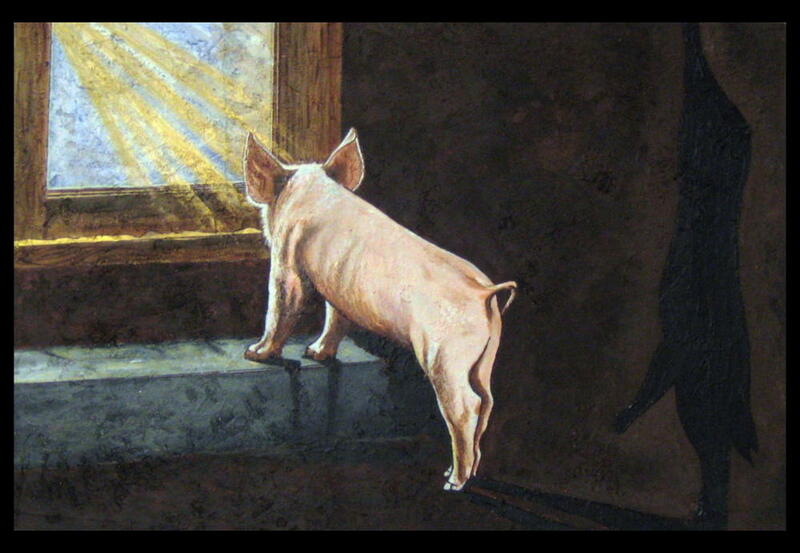 Angie Carreiro, animal rights illustrator, describes the intent behind her painting: “Behind closed doors innocent, helpless, scared pigs cower in fear from the everyday horrors they face. 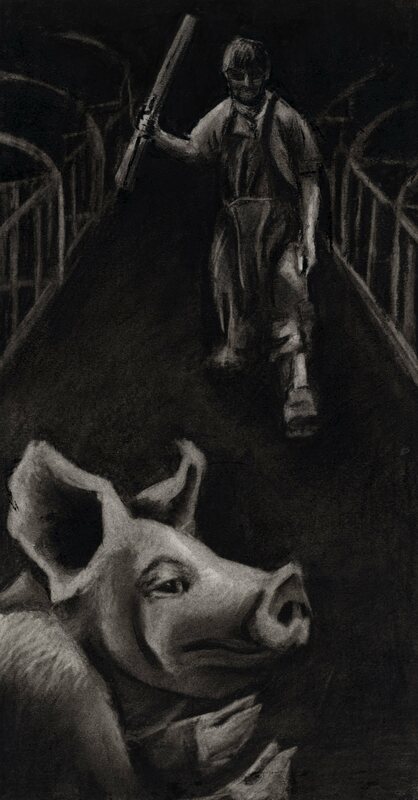 Slaughterhouses can only inspire violence. Hopefully this can inspire change.” See her website here. 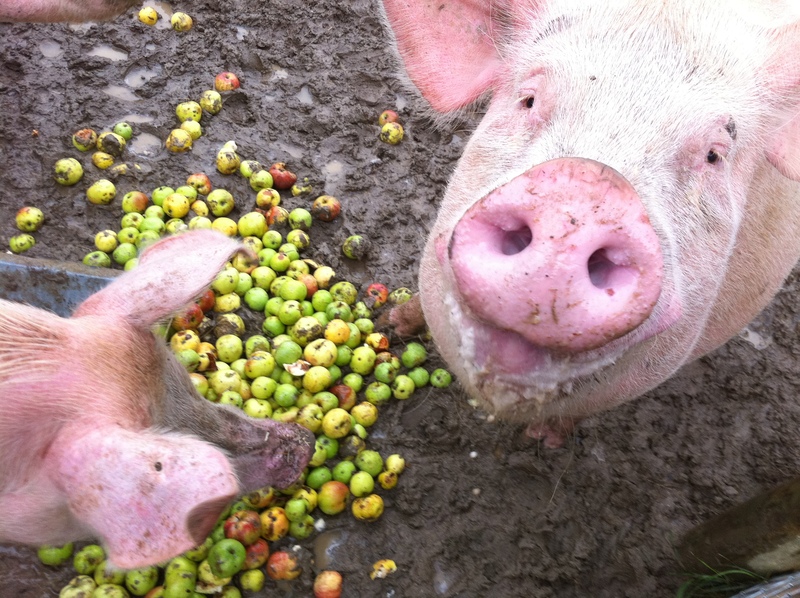 Kevin Weil took these photos at Farm Sanctuary where there are a lot of apple trees, so the pigs get special treats during those seasons! Kevin’s email is weilkevin@me.com.